Fifty-five years ago at Ladysmith, Natal, I met a distant relative with vivid memories from her childhood about a godly Seventh-day Adventist teacher in the 1920s or the 1930s. Apart from his normal subjects, he taught Bible, which was a feature of all the schools in the old South Africa. One day he talked about Martin Luther and said to his class: “Children, one day there will be another and greater Reformation than in his time.” She did not belong to our Church but never forgot his words. On 31 October 1517 Martin Luther (1483-1546) nailed his 95 theses against indulgences to the church door at Wittenberg, Germany, and—without planning it— kindled the Reformation of the sixteenth century. At first he hoped that the Church of Rome would accept his Protestant message of righteousness by faith and turn away from all its false doctrines and corruptions. But it did not. Quite soon he realized that Catholicism, headed by the man at the Vatican, was not going to change in any meaningful way. Immediately after his magnificent stand for the truth and his refusal to recant at Worms, before the emperor, the princes, and other dignitaries of the Holy Roman Empire, a stake awaited him. On his way home, however, his sup-porters kidnapped and spirited him away to the Wartburg castle, where he translated much of the Bible into German. Heaven protected him there, but other Protestants were not so fortunate. Many of them were burned or slaughtered. Within a few years, Protestantism spread like wildfire through northwestern Europe. 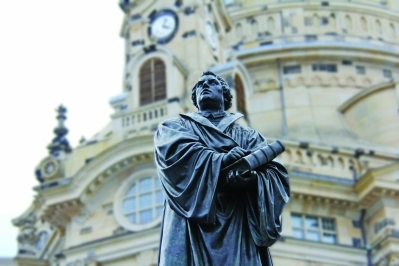 Other Reformers proclaimed a message similar to that of Luther, especially from Geneva, Switzerland. Country after country, adopted the Reformed religion. To the papacy it eventually became plain that murdering individuals could not extinguish Protestantism. Therefore, a century after 1517, when Luther lifted the hammer to nail his document to that door, the Catholics marshaled entire armies to destroy it in what became the Thirty Years’ War (1618-1648), the most destructive conflict that ever ravaged modern Europe. Rome, however, did not give up. What she could not achieve by force of arms, she sought to gain through theological subtlety. The Catholic Church proceeded to cleanse itself of its most obvious corruptions through a Counter-Reformation, inaugurated at the multi-session Council of Trent (1545-1563). It also had at its disposal a powerful new tool, the Society of Jesus, or Jesuits, created by Ignacio de Loyola (1491–1556) and approved by the Vatican in 1540. The basic purpose of this order was and is to defend the pope. The Achilles heel of the papacy is prophetic Historicism. This interprets the predictions of the Bible by comparing them with the events of history, which the Protestants effectively used to show that the pope is the Antichrist. But in the late sixteenth and early seventeenth centuries, three Jesuit scholars tried to blunt the effectiveness of Historicism by deflecting attention away from the Roman pontiff, through two alternative methods of prophetic interpretation. Luis del Alcázar (1554–1613), a Spanish Catholic theologian, wrote Vestigatio arcane sensus in Apocalypsi (An Investigation into the Hidden Sense of the Apocalypse), a book of 900 pages. This tome was published in 1614, a year after his death. He maintained that everything in the book of Revelation, apart from the three last chapters, referred to things that have already happened. This work is also “regarded as the first major application of the method of interpretation of prophecy by reading in terms of the author’s contemporary concerns.” 3 Strangely, in the twenty-first century, some Seventh-day Adventist writers on prophecy adopted a similar approach. The Antichrist should, according to the Vestigatio, be identified with a pagan Roman persecutor of Christianity who lived a long time ago. He could therefore not be the pope. Because it points back to the past, this approach to prophecy is known as Preterism. As pointed out in my book, The Truth About 666 and the Story of the Great Apostasy (2011, 2013), del Alcázar was also indebted to the allegorical method used by Origen, partly under the influence of pagan Neoplatonism, to whom prophetic Idealism is traceable. A fellow Spanish Jesuit Francisco Ribera (1537-1591), also wrote an anti-Historicist book to deflect the finger of accusation that Protestants were pointing at the pope. It bears the title In Sacrum Beati Ioannis Apostoli, & Evangelistiae Apocalypsis Commentarij (1590), this work on the book of Revelation is likewise of great length (500 pages). It appeared a year before its author died. Unlike Luis del Alcázar, Ribera mostly did not point back into the past but to the Future. He proposed that only the first few chapters of the Apocalypse applied to ancient pagan Rome but projected the rest to a brief period immediately before the Second Coming. This, he insisted, would not be a symbolic 3½ years, 42 months, 1,260 days, based on the Historicist idea that in prophecy a day is equal to a year of calendar time (Numbers 14:34, Ezekiel 4:6). No, he maintained, it would be a literal 3½ years. 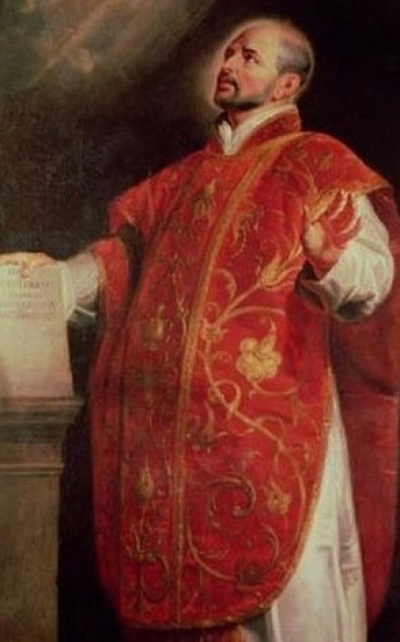 4 Cardinal Archbishop Roberto Francesco Romolo Bellarmino (1542-1621), was another Jesuit Futurist. For more than two hundred years, Lutheran and other Reformers either ignored or refuted these Jesuitical attempts to undermine Historicism. Especially one writer did so magnificently a little more than four centuries ago. His masterpiece was Antichristus Romanus (the Roman Antichrist), which appeared in three editions: 1600, 1612, and 1630. This work called attention to Vicarius Filii Dei (The vicar of the Son of God), a very old pontifical title, which has a numerical value of 666. He was the first Historicist prophetic interpreter who did so. In later life, he became the rector of the gymnasium at Stralsund, where he also continued his scholarly work. Eventually he produced a final, definitive edition of his book. It appeared during 1630, with a striking subtitle. In English this reads: The Roman Antichrist, Revealed by His Own Name: Made Public and Subjected to the Glory of our Lord Jesus Christ, the Highest and Only High Priest of the Church, Whose Honor and Seat This Vaunted VICarIVs fILII DeI Claims for Himself and Imposes upon the Entire World the Judgment of the Holy Catholic Church, by Master Andreas Helwig, Rector of the Stralsund Gymnasium. This last edition was almost never published, being completed during the Thirty Years’ War (1618-1648). Dated 25 June 1630 at Stralsund, it was dedicated to the great Swedish monarch, Gustavus Adolphus. At the very time when Helwig was putting the finishing touches to his book, this mighty warrior was playing a crucial role in the Thirty Years’ War, ensuring the survival of Protestantism against the Catholic armies marshaled to blot it out. What makes Helwig’s Dedication so fascinating is that just two years earlier, in 1628, Stralsund—“the last remaining Protestant bastion in Pomerania”—was saved in the nick of time from Wallenstein’s army, by Gustavus Adolphus together with Christian IV, the Danish King. We need hardly doubt that Helwig, by not falling into his enemies’ hands, as a notorious heretic escaped a most unpleasant fate. He owed his very life to the Swedish king. It is pleasant to imagine Gustavus Adolphus in late 1630 sparing a little time to read the dedication and sad to know that only two years later he would fall in battle at Lützen on 6 November 1632. But the Catholic armies and the accompanying Inquisition overspreading so much German, Protestant territory may also have contrived to destroy nearly all the copies of the 1630 edition. A few, however, did survive. One of them came into the possession of Carl Frederik Muhrbeck, whose identity is obscure. In 1772, he gave it to the Västerås City Library, Sweden. There it lay silently since then, for 235 years—from before the American Revolution. Fortunately Helwig’s editions have now also acquired digital immortality and are no longer confined to a few locations. Just before and while William Miller, a Historicist, was studying out his interpretation of Biblical prophecy, in 1826 Samuel Roffey Maitland (1792-1866). wrote a seventy-two- page pamphlet entitled Enquiry into the Grounds on which the Prophetic Period of Daniel and St. John Has Been Supposed to Consist of 1260 Years. In it, he emphat-ically rejected the year-day principle, without which the traditional Protestant interpretation would collapse. He was a librarian to the Archbishop of Canterbury at Lambeth Palace, where he found a copy of Ribera’s book and even had it reprinted. Maitland in turn influenced J. H. Todd at Trinity College in Dublin, Ireland. By 1838 the latter was openly teaching the same anti-historicist teaching. Several other Futurists also had connections with that college, including W. Burgh (afterward De Burgh) and J. N. Darby. The latter was an early leader in a movement which started near Dublin and later in England became known as the Plymouth Brethren. Darby studied at Trinity College and after becoming an Anglican priest accepted the dispensational Futurism which is now so widely spread in evangelical Protestantism. Simultaneously with these developments in prophetic interpretation, the Oxford Movement arose within the Anglican Church and was aided by Futurism in its increasing orientation towards Roman Catholicism. The Oxford Movement was significant, not only for causing some of its leaders to defect from the Church of England to the Church of Rome. It also promoted Anglo-Catholicism among those who did not, as well as ecumenism. These developments are dealt with in greater detail by two of my publications, the interrelated Use and Abuse of Prophecy: History, Methodology, and Myth (2007) and A More Sure Word of Prophecy (2015). Catholic Futurism is the theological ancestor of Protestant Dispensationalism. Together with Preterism and Idealism, these alternative methods of prophetic interpretation—largely the result of Jesuit thinking—have almost completely eliminated Historicism. This is a striking example of what Ellen G. White has so aptly called “false prophecy . . . kindled from the hellish torch of Satan” (Testimonies to Ministers and Gospel Workers, 409, 410). Nowadays liberal Protestants are usually Preterists. On the other hand, Southern Baptists and other more con-servative Protestants, have mostly—in the form of Dispensationalism—accepted Ribera’s interpretation. They no longer believe that the Roman pontiff is the Antichrist of Bible prophecy. Like Evangelicals who favor ecumenism, they have, eschatologically speaking, been totally vanquished by the Vatican. This, alas, is also true of the Lutheran Church. The Catholic Counter Reformation, which since the sixteenth and seventeenth century has never flagged, has been spectacularly successful. Edwin de Kock, international lecturer, writer, and has published in three of the thirteen languages he is acquainted with. His fascination with prophecy and history began in his native South Africa more than fifty years ago. He has qualifications in theology, literature, education, and speech. He was a professional educator for more than thirty-five years, in South Africa, South Korea, and the United States, especially as a college teacher. He finished this career as a writing professor at the University of Texas, Pan American, from 1996 to 2000. 2. Wikipedia, s.v. “Gustavus Adolphus"
4. Wikipedia, s.v. “Francisco Ribera"